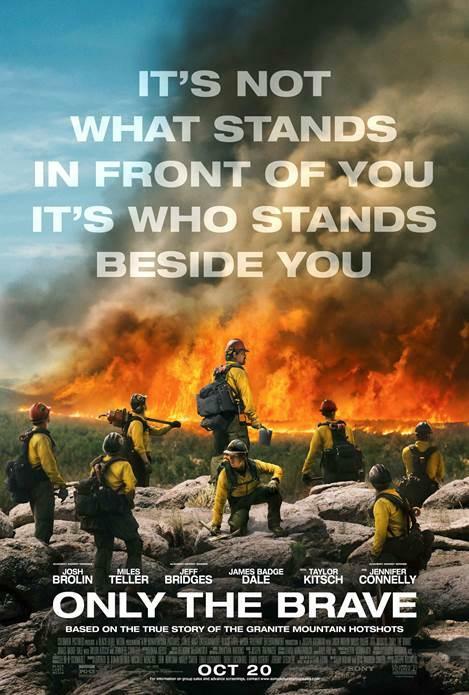 We're happy to offer our DC reader the chance to attend a free advance screening of Only the Brave, starring Josh Brolin, Miles Teller, Jeff Bridges, Taylor Kitsch, James Badge Dale, and Jennifer Connelly. SYNOPSIS: It’s not what stands in front of you… it’s who stands beside you. Only the Brave, based on the true story of the Granite Mountain Hotshots, is the heroic story of one unit of local firefighters that through hope, determination, sacrifice, and the drive to protect families, communities, and our country become one of the most elite firefighting teams in the nation. As most of us run from danger, they run toward it – they watch over our lives, our homes, everything we hold dear, as they forge a unique brotherhood that comes into focus with one fateful fire. The screening takes place tomorrow, Tuesday October 17th at 7:30pm at AMC Mazza Gallerie. If you'd like to attend, simply go to the Sony Pictures ticketing site here and download an Admit-Two pass. Please remember that having passes does not guarantee entry. You will need to arrive early to ensure receiving a seat. Enjoy the show! Only the Brave opens October 20th.